This wooden box is from Gujarat, India, and dates to the early 1900s. Simple in its design, the teak box’s only adornment is found in its brass handles. Inside, a removable tray provides access to items below. 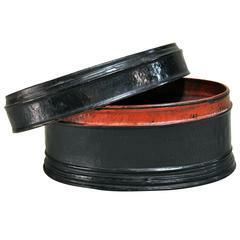 This oval lacquer ware box is from Chiang Mai, Thailand and is made from bamboo and lacquer. This rustic Chinese food box is from Shanxi, China and made from elmwood, circa 1800s. This handsome wooden storage box is from Gujarat, India and was from the early 20th century. The reinforced strongbox was made from teak wood with hand-forged metal banding. This storage box is from Gujarat, India and was made from teak wood and hand-forged iron branding, circa 1940. Very decorative solid wood jewelry box in excellent condition. Tiny details have been carved in the top of this small wooden box from Poland. The outside of the box has been stained and the carvings have been stained dark. The inside is unfinished. Hinged wooden box with inlaid brass strips - a unique storage piece, handsome in any setting.